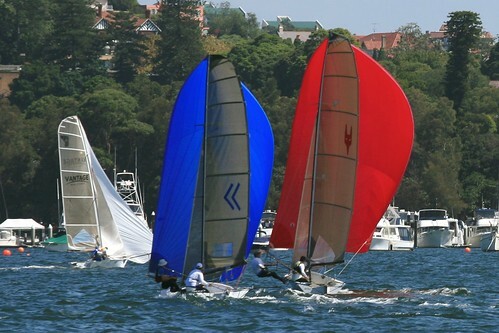 The Port Jackson Championship will be held on the 3rd March 2013 at Woollahra Sailing Club. The notice of race can be download here. 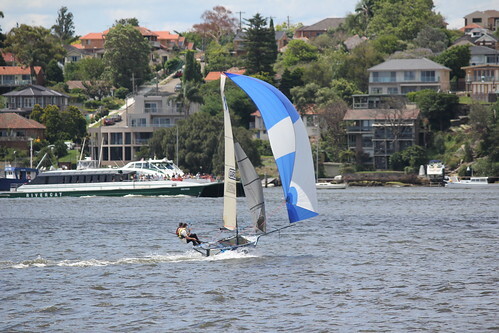 This entry was posted in News and tagged Woollahra Sailing Club on February 16, 2013 by Karmen. 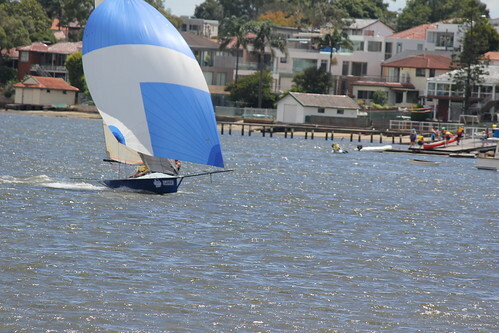 The 12ft Skiffs made their annual trip to Saratoga for the Brisbane Water Championship on Sunday. The forecast southerly breeze kicked in at just the right time to make an easy rig choice. 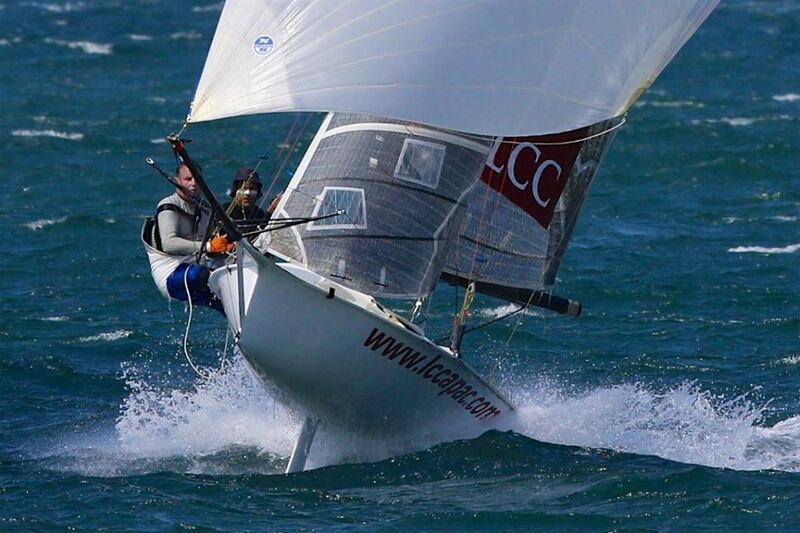 3rd rigs all round and the flat water had the boats blasting down wind in 20 knots of breeze. Lincoln Crowne won the championship, virtually lead from start to finished. 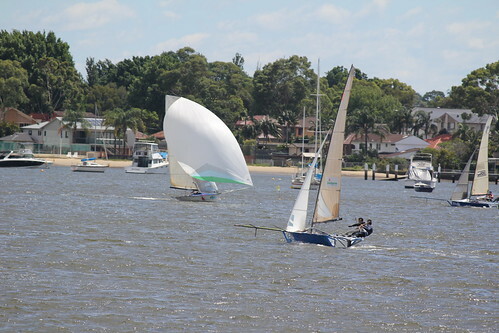 After getting a good start, they held a slender lead up the first work from Gemmell Sails (Andrew Stevenson and Scott Lanham), and Garde in 3rd, most skiffs hitting the right hand side of the course. Garde snuck in for 2nd place at the top mark rounding, and closed the gap to 1st place at the wind mark. Gemmell sails had a swim at this point during the jibe to put them back and allow Hood into 3rd place, who had a stellar first work. Garde nearly gained an overlap on Lincoln at the bottom mark approach, but were held out by a boat length. Variety had a little more success with this manoeuvre to put them into 3rd ahead of Hood. Skoll dropped a rig early on in the downwind leg after being well placed at the top mark. Reports are that a lower broke and the mast shifted off the step. Lincoln continued to hold a slender leader up the 2nd work, and Variety moved into a clear 3rd. On the 2nd downwind leg, Garde jibed off early and rolled past Lincoln.Lincoln continued to the west side of the course and when Garde came back early, found them selves in less pressure and back in 2nd place once more. Lincoln was never again headed over the next two laps of the course, and went on to a comfortable win. Variety picked up 3rd and vantage came home 4th ahead of Hood. This entry was posted in News, Race Reports and tagged Saratoga on February 10, 2013 by Karmen. 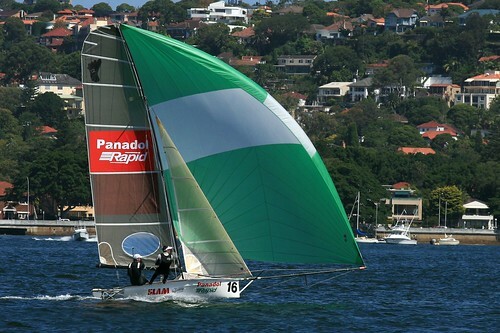 The NSW 12ft Skiff Association would like to offer their sympathies to the Dempsey family following the passing of Jack Dempsey. Jack was a former skiff sailor, president of this Association for 3 years and patron of the class in NSW but will best be remembered for his commitment to the Abbotsford 12 Ft Flying Squadron. Jack was President at Abbotsford for 24 years and gave so much of his time and skill to the club and the class. There is no doubt that Jack’s efforts throughout the years have enriched the Abbotsford club and the 12ft class immeasurably. Jack will certainly be missed. This entry was posted in News on February 4, 2013 by Karmen. 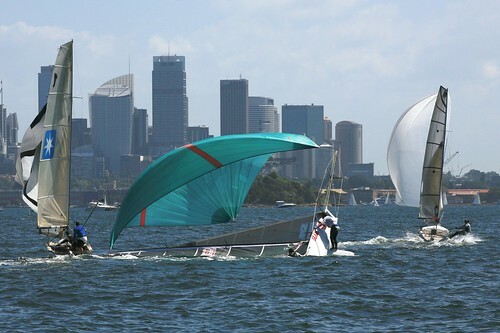 The 2013 Brisbane Water championship will now be held on the 10th February at 2pm. Download the Notice of Race and the Sailing Instructions. This entry was posted in News and tagged Saratoga on January 31, 2013 by Karmen. Gemmell Sails, sailed by Nick Press and Andrew Stevenson, have won their second inter dominion championship after completing a very consistent regatta over the last week and with a race to spare. The win is Nick’s 4th title in a row, and 5th overall. Garde (Brett Hobson and Brad Phillips) finished second, with kiwi skiff C-Tech Performance (Alex Vallings and Frazer Brown) finishing 3rd. 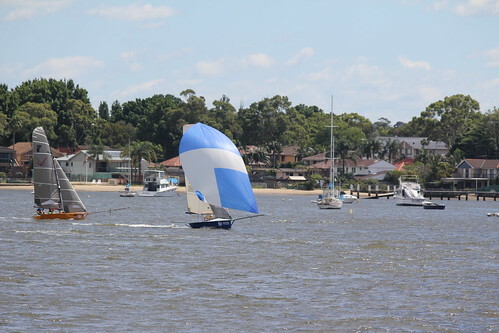 Australian skiff Madonna sailed by David Winning and Peter Bevis won the overall Handicap. This entry was posted in News, Race Reports on January 13, 2013 by Karmen. The 2013 interdominions are 7 heats old. Check out all the results on the Queensland 12fters site here. This entry was posted in Race Reports on January 9, 2013 by Karmen. This entry was posted in News and tagged 2012 States on December 12, 2012 by Karmen. This entry was posted in Race Reports on December 2, 2012 by Karmen. Download the 2012 State Championships Notice of Race here. This entry was posted in News on November 14, 2012 by Karmen. Special thanks to Design Manager, Karmen Karamanian who built the site. This entry was posted in News on September 19, 2012 by Karmen. 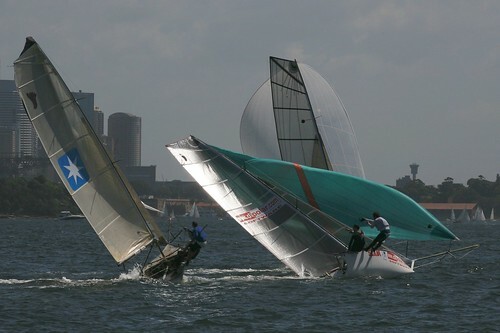 The Queensland 12ft Skiff Association (on behalf of the Brisbane 18ft Sailing Club) propose to host the 2013 12ft Skiff Interdominion Championship on Brisbane’s Waterloo Bay. 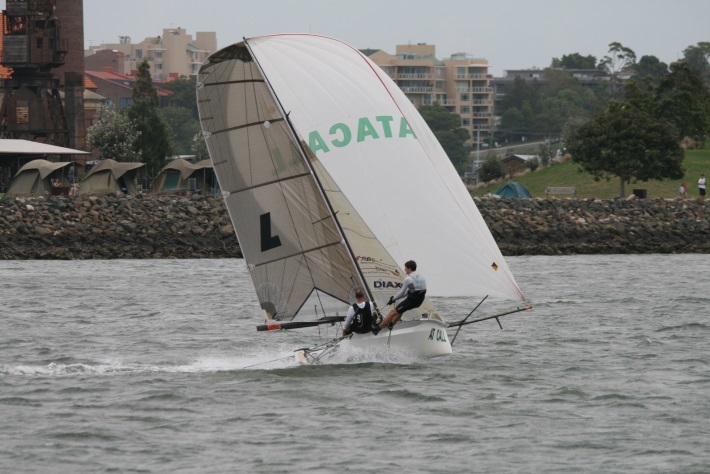 QLD 12ft skiff Interdominion Regatta Page. This entry was posted in News on March 10, 2012 by Karmen. 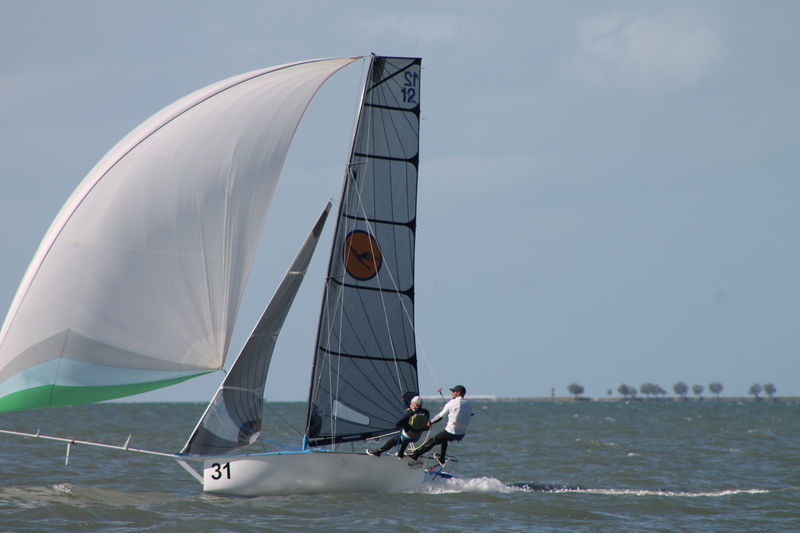 Nick Press and Andrew Stevenson sailed Gemmell Sailmakers to victory in the 12ft Skiff Interdominion championships over the new year period. The win brings up a hat-trick of victories for Nick, who won the last two events aboard his normal boat Dimension Polyant. To make the win even more impressive, it is the first time that Nick and Andrew have teamed up, the first time Andrew has crewed at a regatta, and all in a borrowed boat. A smaller than usual contingent of 12’s contended the event, but there was no shortage of top boats with 6 time champion Tim Bartlett in the mix, along with recent Auckland champion’s C-tech (Chris Reid and Ben De Fluiter), Australian crews of Garde (Brett Hobson and Alex Johnson) and the renamed skiff of JJ Robertson (Adam Forbes and Richard Johns). The regatta started off well for Gemmell Sailmakers, taking out the invitation race and heat 1, all sailed in a 25-30knot north east breeze with large waves caused by wind against tide. The breeze took its toll on most crews for heat 3, and when Gemmell had a capsize they finish 5th. Garde finished 1st with C-Tech 2nd. 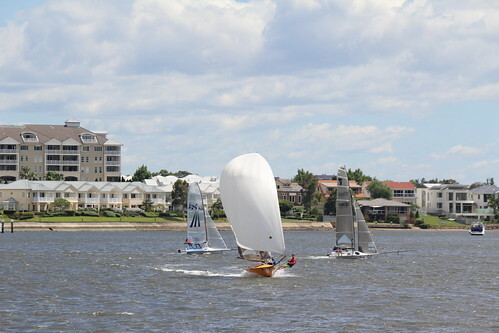 The breeze swung to the south west for heats 3 and 4, but remained fresh. The first race of the day was postponed on shore for 2 hours as the wind was gusting above 35knots. When the breeze dropped and the racing got underway, it was the C-Tech crew who got the jump on the fleet and went on to record their only win of the series. Gemmell were not far off the pace to pick up a 3rd place. 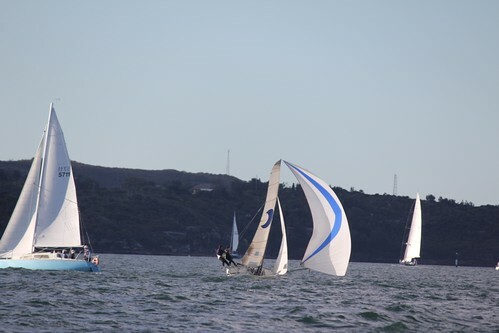 In heat 4 it was another kiwi crew that blasted up the first work, that of Tim Bartlett in Frankinskiff, to put a good lead on the fleet at the first mark, and go on to take a comfortable win. Gemmell Sails had a swim at the bottom mark rounding during the race to put them back in 5th place. For heats 5 & 6 the breeze went back into the North East, and was a bit lighter than the previous days, with most crews opting for 2nd rig. Gemmell Sails got a bullet in heat 5 from Frankinskiff in 2nd. Tragedy struck the kiwi crew of Absolute CNC (the eyelet pulled out of the head of their spinnaker) in heat 6 whilst they were clear leaders and heading to the finish. This left Garde in the lead down the final run, with Gemmell picking up a 2nd place. Heats 7 & 8 were sailed in a similar breeze, however the morning started off lighter and meant most skiffs went with their big rig. Tim Bartlett showed exceptional speed to lead both races before having a capsize and losing their spinnaker meaning they were soon back in the pack. In heat 7, Gemmell would pick up another win, followed by C-Tech, and JJ Robertson having a stellar race finished in 3rd. All skiffs sailing exceptionally well to get their big rigs around the course. In heat 8 it was the Ugly Stick crew of Simon Ganly and Rod Shave’s time to shine, and pick up their first heat win in an interdominion. After having gear failure in heat 7 and forced retirement, they came out for heat 8 with their 2nd rig and showed true speed. C-Tech finished 2nd, just holding out Gemmell in 3rd and Garde in 4th who had also changed down to 2nd rig. 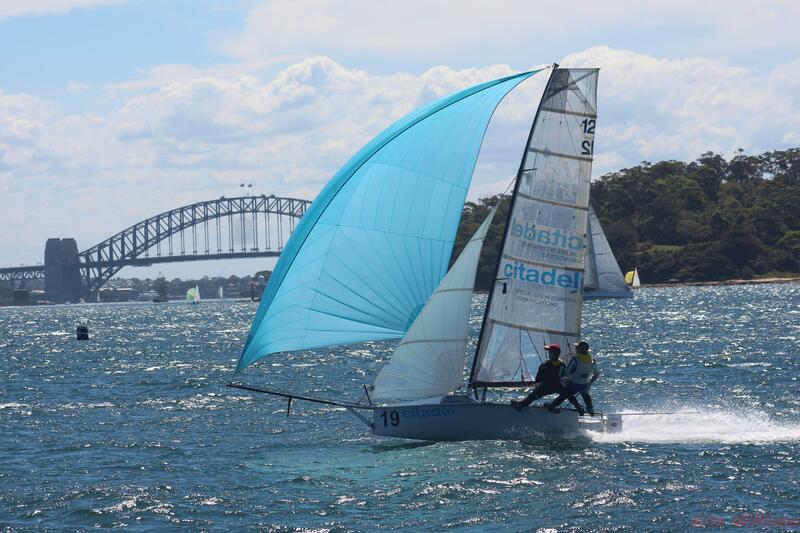 Heat 9 was sailed in a very light and shifty Northerly breeze, and meant the fleet was working into a heavy tide. C-Tech lead for most of the day before falling in a hole on the way to the wing mark for the final time. This allowed Gemmell to overtake and grab another bullet. In the final race, Gemmell Sails just needed to stay within two places of C-Tech to finish off the regatta, and they looked to be doing all the right things off the start, to hold a lead at the top mark. They were never headed from there and went on to record their 5th win of the regatta, enough to claim victory overall from C-Tech by 5 points with Garde a further 4 points back. New Zealand won back the team’s trophy, but not after a strong fight back from the Aussie team after a slow start. JJ Robertson won the Jack Winnng Trophy for handicap champion. 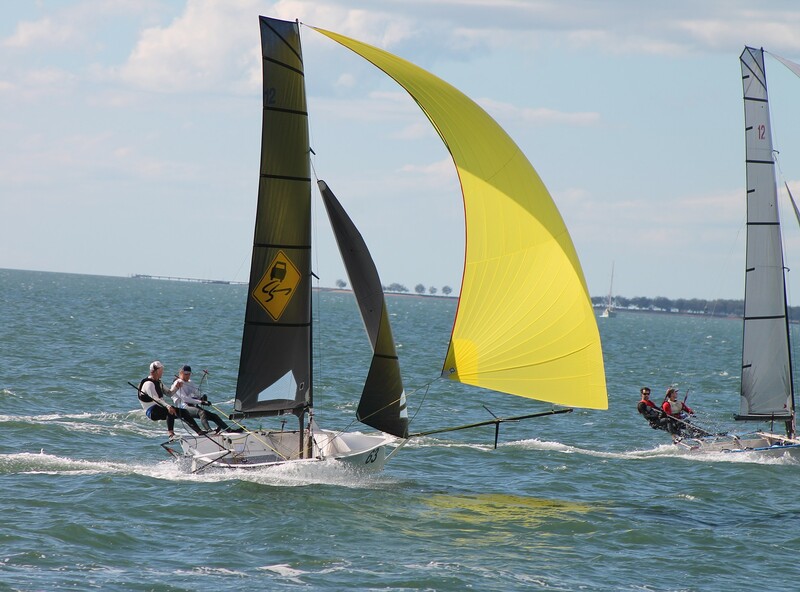 All race results and daily videos from the event are available from the Auckland Sailing Club website, plus there is information on the regatta face book page. 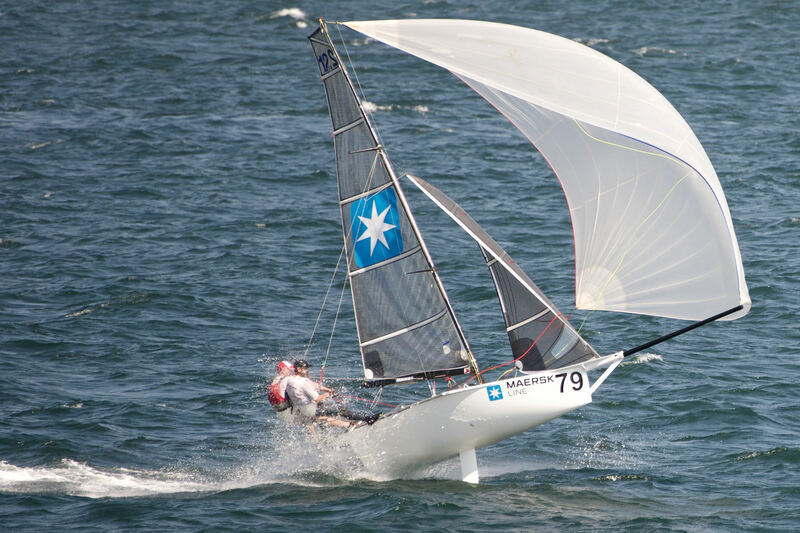 Thank you to Maersk Line and JJ Robertson for their continued support of the event, along with regatta sponsors Harken, North Sails, Fine Line and ARG Marine Media. This entry was posted in Race Reports and tagged Auckland on January 4, 2012 by Karmen. 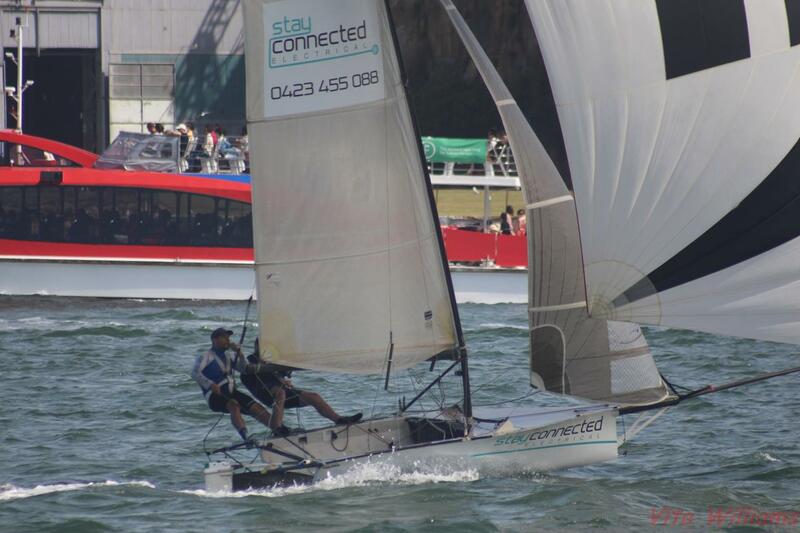 Nick Press and Brad Yabsley have sailed Dimension Polyant to its second win to reclaim the lead in the SLAM 12ft Skiff Interdominion on upper Sydney Harbour today. Locals from the Lane Cove 12s, host of the 51st Interdominion, Press/Yabsley won the first race yesterday on a short course, and backed up again today on a long east-nor-easterly course, claiming the win from NZ entry Nuplex, skippered by five-time Interdominion champion Alex Vallings and crewed by Australian Cameron McDonald, with Garde from Woollahra SC third. “We led from the start and made no mistakes today,” said Brad Yabsley “We got off the start midline and had C-Tech and Nuplex (both from New Zealander) hanging on to us till the top mark, but we rounded and did not look back,” he said. “C-Tech’s ninth place today gives us a bit of a buffer. Bring on more of the top end big rig stuff,” Yabsley said. Nuplex’s crew were happy with their day’s work. “This is our first race together, I’ve just come back from competing at the I14 nationals,” said crew Cameron McDonald, who finished third at that event. ”We never got close to Yabba (Press/Yabsley), but we had a good tussle early on with four boats including Garde (Brett Hobson/Alex Johnson),” admitted McDonald who was struggling with the fact that his skipper was playing the main and not him. “I find it hard to get used to,” he said. Although content with second place today, Vallings commented: “It’s hard to beat Yabba Dabba (Brad Yabsley) in this breeze, which was pretty fresh at times.” After a troublesome first day, one of the SLAM Interdominion favourites, Garde finally came good today with third place. “Everything went wrong yesterday,” Hobson said. “We got caught up in a capsized boat on the start line and it just went downhill from there,” he said. “The boat was quick, but I don’t know where our heads were; things just went from bad to worse. Today we had our heads screwed on right. We got a good start close to the pin, the ducked one or two boats on our first tack and then we went head-to-head with Ginger,” Hobson said, referring to Vallings on Nuplex. “We kept exchanging second and third places, then we had a bad last work, but that’s OK, we’re just taking one race at a time and to finish the regatta top five would be good.” It was a bit of a Kiwi slaying today – Aussie boats were first and third, but everyone else up to and including seventh place were New Zealand boats. Perhaps it is because of a Twitter message sent over the airwaves to the Kiwis. It appears the SLAM 12ft Skiff Interdominion is being followed even by those at sea. Alex Vallings former 12 crew, Andy Meiklejohn, who is crewing on Hugo Boss in the double-handed around the world Barcelona Race, took time out to send a Twitter message overnight: “A little more breeze would be nice but we are still hoping for gains. 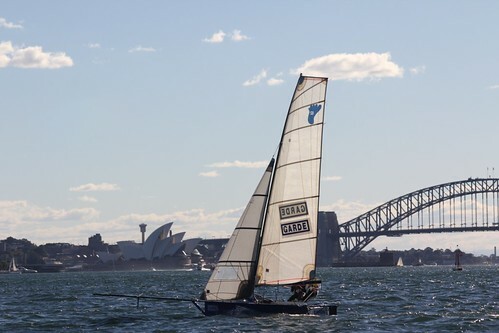 Go the Kiwi skiff team at the 12ft Interdominions in Sydney!” New Zealander, Meiklejohn, is awaiting the return of his skipper, Alex Thomson, who is recovering from an emergency appendix operation. He and last-minute replacement skipper, Wouter Verbraak, are currently at the back end of the field. We wish them all the best. The fleet got away in an east-north-easterly, but not before a general recall and then some OCS’s at the 2.40pm start. Disappointment for a few on what was otherwise a beautiful day out with 12-15 east-nor-easterly wind under sunny blue skies. First out after crossing the start too early were Alison Chapman/Tim Barraclough (CST Composites) and Martin Debelle/Ian Turley (Barking Mad) both from Woollahra Sailing Club. A third Woollahra boat, D-Unit (Adam Forbes/Richard Johns) thought they were over too, so returned and re-started, losing them valuable time. Conditions took their toll on others; Arrogant Frog, sailed by father and son Peter and Steve Hill, was first out after the jib cleat let go on their brand new carbon/foam boat. Easily fixed, but not in time for the Abbotsford sailors to get back in the race. 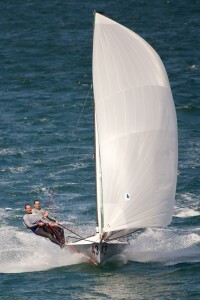 Next ashore were cousins Heidi and David Winning, who ripped their brand new black kite, then it was the turn of another father and son combination, New Zealanders Billy and Will Wright sailing W2, whose prod broke off the front of the boat when a power boat sped in front of the 12. This on top of Will doing a ligament injury to his ankle yesterday, which will keep him ashore for a couple of days. 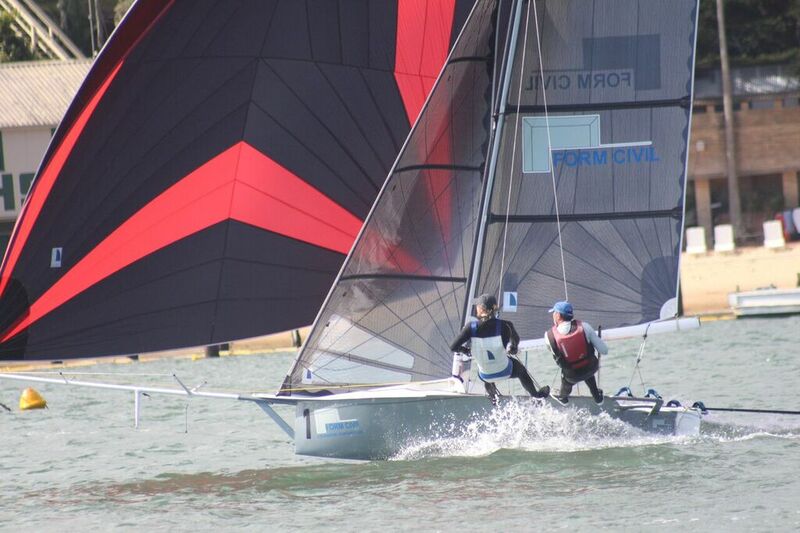 Late in the race, Martin Hughes design’s mast snapped, leaving Sam Marshal/Sam Trethewey from Auckland floundering. 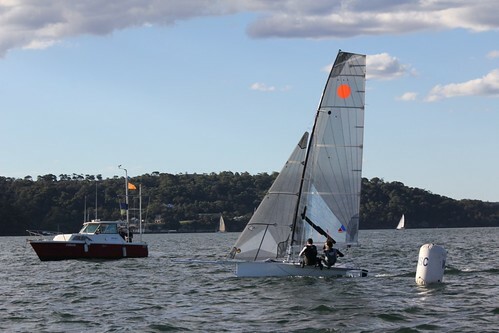 Hosted by Lane Cove 12ft Skiff Sailing Club, with the cooperation of Hunters Hill Sailing Club, Race 4 of the 10 race 51st Interdominion will be held tomorrow, starting from 2.30pm, weather dependent. 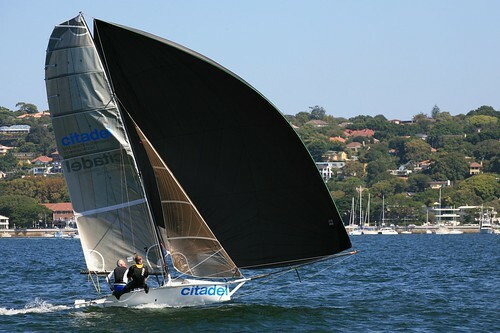 Today’s Race 4 of the SLAM 12ft Skiff Interdominion on Sydney’s upper Harbour was a thriller to the end, Lane Cove’s Dimension Polyant taking the lead from New Zealand’s Frankenskiff down the last run of the easterly course and fighting off challenges from the Kiwis for the rest of the race to consolidate their series lead. Nick Press and Brad Yabsley representing Lane Cove 12s, came ashore exhausted but happy with their third win from four races. 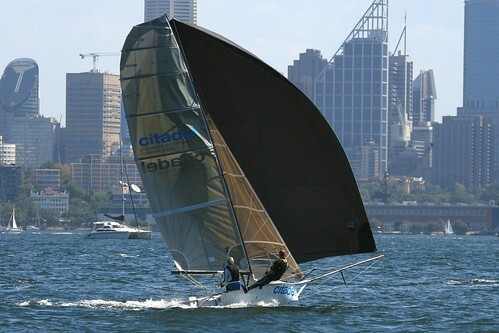 They are on six points, 13 clear of nearest rival C-Tech (Chris Reid/Ben de Fluiter, NZL), after beating 59 year-old Tim Bartlett, the record-holding winner of six Interdominions and his crew Adam Miller (Frankenskiff) over the line by seven seconds. Press said this afternoon “It was good tight racing. We didn’t get a good start and rounded the top mark in sixth place. We started to pick them off one by one. 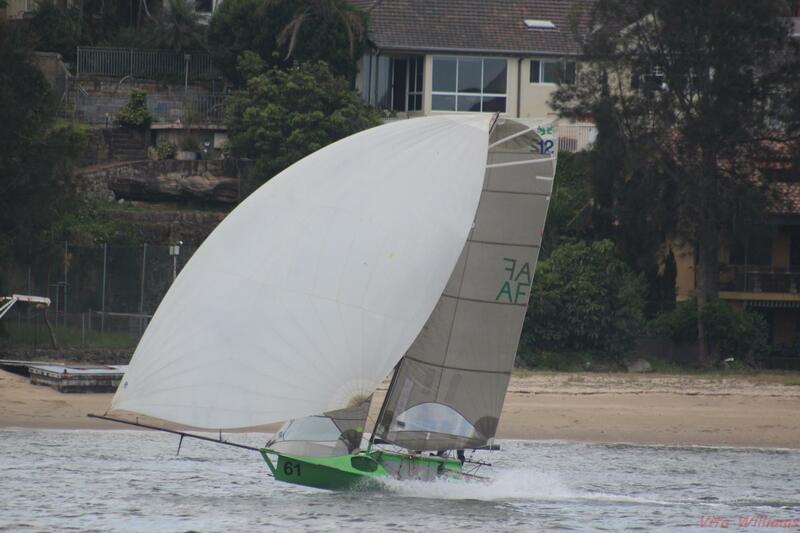 We got Frankenskiff on the last run when they screwed up a gybe and we sailed straight through them in good pressure. Yabsley takes up the story: “After that, they got a good lift off Greenwich and we got the headsail twisted around the forestay and they caught us up,” he said. Press continued: “From there, it was tack for tack. It was very stressful. They were smoking downhill – they’re very quick. At the top mark for the last time, there was only a millimetre between us, and we gybed just in time to beat them over the line.” Frankenskiff’s Adam Miller responded: “It’s hard for us old boys to keep up with the younger guys. It’s really hard work sailing against Dimension Polyant, they’re really good sailors and we don’t get out every week and sail like a lot of these guys do.” Third place today went to Michael Spies/Damian Vlotman on Andrew Short Marine from Lane Cove, but not before a challenge from Woollahra Sailing Club’s Brett Hobson/Alex Johnson on Garde. 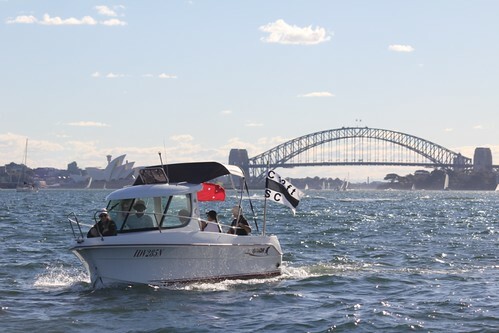 “It’s the first time we had the second rig in – so it was great to lead the fleet early on, we’re not as fast as some of the others,” Spies, from Lane Cove, said ashore this afternoon. “I think that’s my best result as a skipper in the Interdominion,” said Spies. “I think Garde let us off the hook a bit,” he said, referring to the last run when Hobson/Johnson overtook them momentarily but allowed back in. 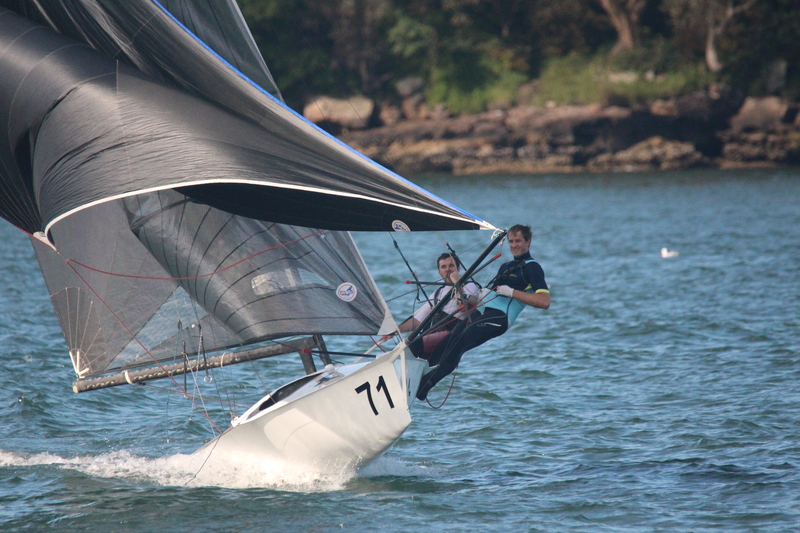 Gemmell Sails (Murray Press/Ben Gemmell) from Lane Cove are third overall on 21 points after their sixth place today, with Andrew Short Marine just one point adrift of them, with Garde holding down fifth spot, a further point away. 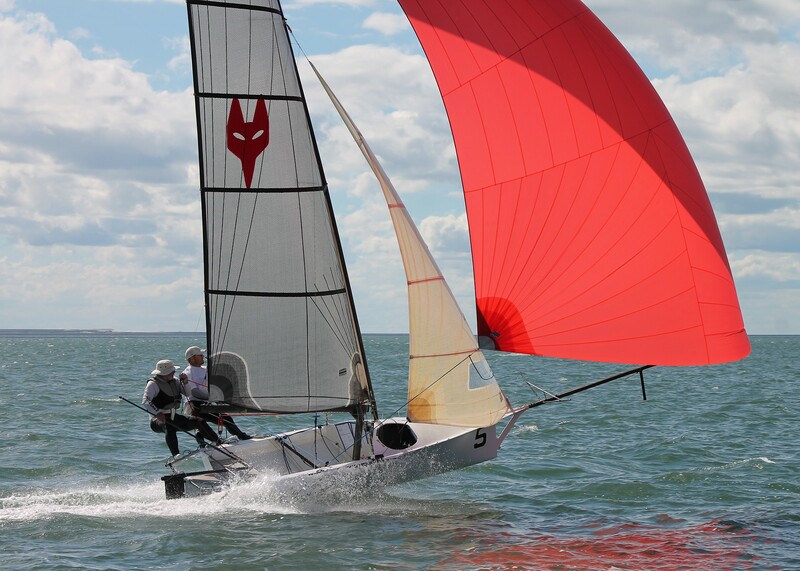 The oldest team in the fleet, Jack Winning (62) and Brett Phillips (53) also had a great day, their seventh place overall handing them the handicap win. There was less carnage today as the gusts were fewer and far between in a predominantly easterly breeze that veered east-north-east at times, on a hot and humid day. Early disappointment for five-time Interdominion champion Alex Vallings (NZL), who broke a side stay on Nuplex before the race started, and that was the end of the boat race for he and Cameron McDonald. 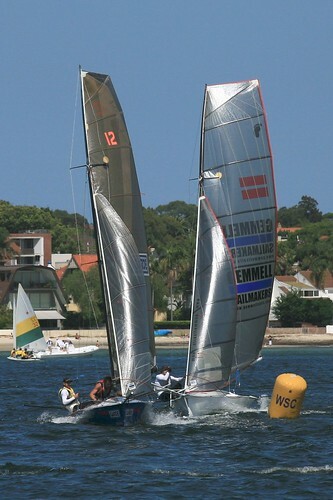 After returning to the start line yesterday, convinced they were over early, Adam Forbes/Richard Johns on D Unit should have considered that move for today, as they were pinged for being over the start early and having no idea, the Woollahra Sailing Club pair continued to race. At Call Powered by Bainbridge International Ed Blackman/Brad Greenrod (Lane Cove) and ASCC crewed by Nick Catley/Joshua McCormack (NZL) also retired. 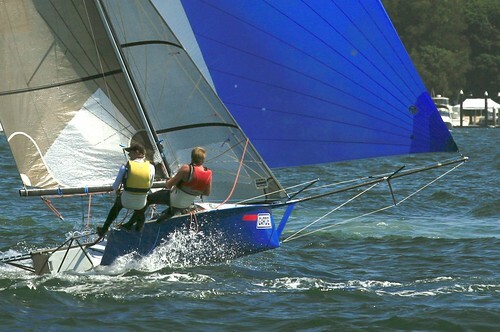 Hosted by Lane Cove 12ft Skiff Sailing Club, with the cooperation of Hunters Hill Sailing Club, tomorrow is a layday. Races 5 and 6 of the 10 race 51st Interdominion will be held on Tuesday, starting from 2.30pm, weather dependent. Once six races are completed, a race drop will come into play and is certain to change the results up, with some of the top contenders already scoring DNF’s over the last three days. 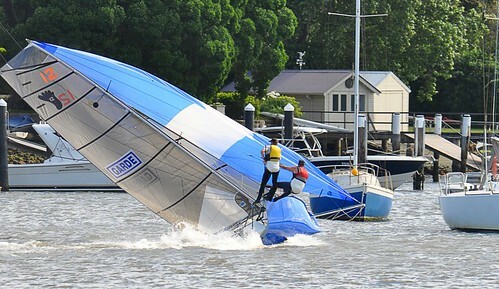 SLAM 12ft Skiff Interdominion was a day of carnage as a big gusty east-nor-easter picked off one boat after another in Race 7 at Hunters Hill today – and not even the top starters were immune – startled river cat passengers saw all off Cockatoo Island as the out-of-control skiffs barrelled downwind under kite. Some survived, some did not. It was a day of ‘no guts, no glory – and when the going got tough – the tough kept going. It was day that belonged to 2009 Interdominion champion and reigning national champion, Garde, crewed by Brett Hobson and Alex Johnson from Woollahra Sailing Club who came home with two wins and big grins. ‘It was pretty gusty – pretty gnarly,’ Johnson said of the winds that peaked at 30 knots. ‘You had to pay attention the whole time or you’d find yourself in the drink. You had to keep an eye on the traffic, the gusts and the shifts, but we had a big win in Race 7,’ he said. Skipper Brett Hobson commented on their day. ‘We’ve got a day to go and we have to remember that, but it feels great to come ashore with two wins. We tried to keep our noses clean and tried to sail a bit safely; we took it one mark at a time,’ he said. ‘That was one of the hardest days I’ve sailed. The sea was short and sharp,’ Hobson admitted. Chris Reid, the skipper of Kiwi entry C-Tech agreed: ‘I have to admit I’ve struggled with the venue a bit; the traffic and the shiftiness, but everyone’s had to deal with the same stuff. There were a few ferries on the course today and a few of the skiffs got taken out in the lull behind a ferry. It was tough but fun at the same time,’ he said. His crew, Ben de Fluiter commented: ‘I don’t think I’ve ever sailed in a place that’s as hard as this one.’ Maybe that’s why the next two best boats did so well. 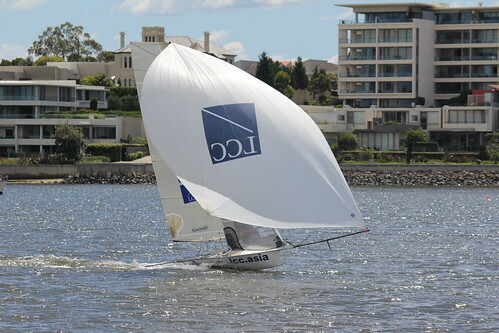 Series leader, Dimension Polyant (Aus), sailed by Nick Press and Brad Yabsley and Gemmell Sails crewed by Nick’s dad Murray Press and Ben Gemmell both sail for the SLAM Interdominion organisers, Lane Cove 12ft Skiff Sailing Club. Press/Yabsley scored third and second places today, while Press/Gemmell came home with a pair of fourths. ‘We had a great day really – no swims – so that was a bonus. We tried to say conservatively, but that was impossible in those conditions. I reckon we were doing 20 knots in 30 knots of breeze at times,’ Murray Press said. ‘The Garde and Dimension Polyant guys know how to drive a boat hard in that sort of weather and it makes for great viewing. You can do that when you’re young!’ In what is now a close series, the reigning Interdominion champions Dimension Polyant (AUS) leads Garde by three points, with Gemmell Sails third on 20 points with two race drops in place. So the SLAM Interdominion and the Silasec trophy will go to one of the top two. While the day belonged to the top boats, spare a thought for others. 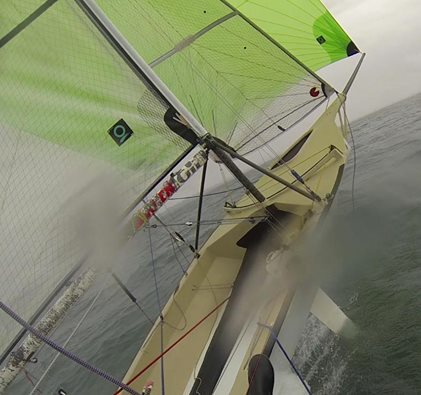 The crew of Arrogant Frog, Steve Hill, did a swan dive through the headsail, which tore right down the seam, ending their day. Maersk Line broke the top section of their mast, her skipper Jakub Ronowicz is still wondering how it happened. 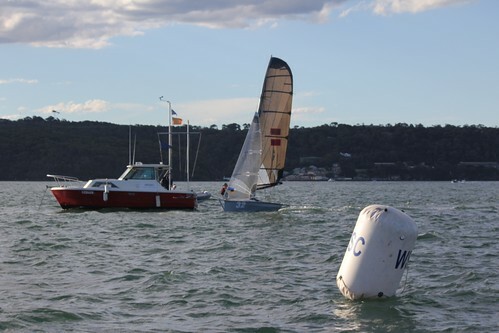 The Lane Cove skipper told, ‘We’d just rounded the top mark and put our spinnaker up, but it didn’t feel right. I didn’t hear anything, but I looked up and the top section was missing.’ CST Composites from Woollahra pulled out of the race, but her crew made quick repairs in time to make Race 8, Panadol Rapid (Lane Cove) came ashore with a big headache, Vantage Real Estate (Lane Cove) was unlucky for a second day running and the lone Queensland entry, Squid, also pulled out. More followed. Opposite the Hunters Hill Sailing Club, Rip, Rack, Roar & Rumble (Lane Cove) nearly ended up on the bricks, Ken Williams and Bob Paton’s boat had to be towed ashore, missing Race 8. Back out on the water, there were more lying down than there were standing. 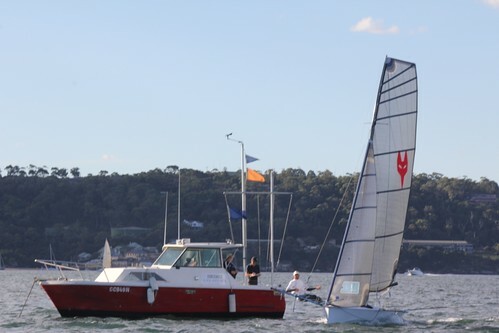 Second overall going into today’s two races, Garde’s crew, Brett Hobson and Alex Johnson (Woollahra SC) sailed down the first run conservatively, not even attempting to hoist a kite. It was to their advantage in the long run. Behind them, the SLAM 12ft Interdominion leaders, Dimension Polyant, went the kite, but quickly hit the drink in the shifty and puffy airs. Many followed behind them, including C-Tech, Gemmell Sails, Frankenskiff, unable to hold up, yet still some behind them chose to hoist – to their disadvantage. A few left their rig choice till the very last and by the time the start gun went just after 2.35pm and it was apparent by then that the small rig was the only way to go. Those with medium really struggled and came ashore before Race 8 to change down. The carnage continued into Race 8 and even the top guys had their moments. Dimension Polyant (AUS) nearly put it in on the second upwind leg and struggled to get back in the race. 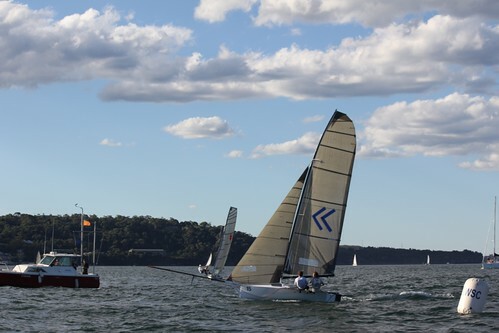 Behind them, Kiwi boat Frankenskiff, skippered by six-time Interdominion champion, Tim Bartlett, was not so lucky, capsizing just off Hunters Hill SC as the wind continued to fluctuate and shift. Cousins Heidi and David Winning were first out of the race, followed shortly after by Dipolar Software from Lane Cove and Martin Hughes from Auckland. 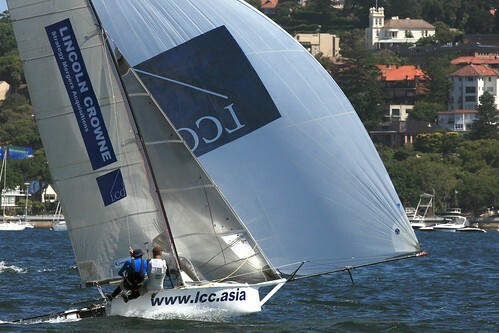 Then Craig Ganley and Craig Anderson brought Dimension Polyant (NZ) ashore with a broken mast. 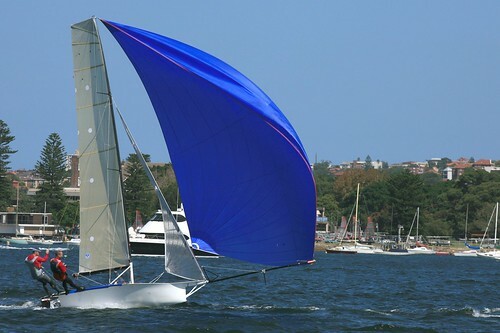 Hosted by Lane Cove 12ft Skiff Sailing Club, with the cooperation of Hunters Hill Sailing Club, the 51st SLAM 12ft Skiff Interdominion has layday tomorrow and concludes with two races tomorrow and finishes on Friday, 14 January. Nick Press and Brad Yabsley from Lane Cove 12ft Skiff Sailing Club have successfully defended their 2010 Interdominion title, sailing Dimension Polyant to a convincing win in the final race win at the 2011 SLAM 12ft Skiff Interdominion hosted by Lane Cove 12ft Skiff Sailing Club this afternoon. 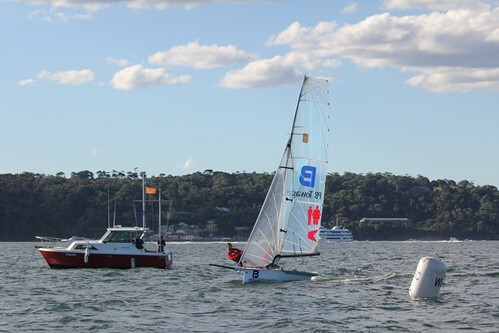 It was all over at the end of Race 9, when Dimension Polyant came home second behind New Zealand entry Frankenskiff (Tim Bartlett/Adam) Miller in Race 9 this afternoon, with their nemesis, Brett Hobson and Alex Johnson on Garde, third. Press and ‘Yabba’, who have led the series since day one, knew their finish in front of Garde guaranteed them their second title in succession. They were then able to leave the pressure of winning behind them to enjoy the final Race 10, which they won by a massive 2 minutes 20 seconds from Frankenskiff, which had a cracker of a day. Five-time Interdominion champion Alex Vallings (NZL) with Fraser Brown and Cameron McDonald filling in variously as crew, finished the series third overall. “It’s a really good feeling,” a smiling Nick Press commented this afternoon. In the second race (Race 10) we really let go, because it was already all over,” he said. Press could not differentiate as to which was more difficult to win, the 2010 title, or this year. “Both were as hard as each other. We worked really hard. 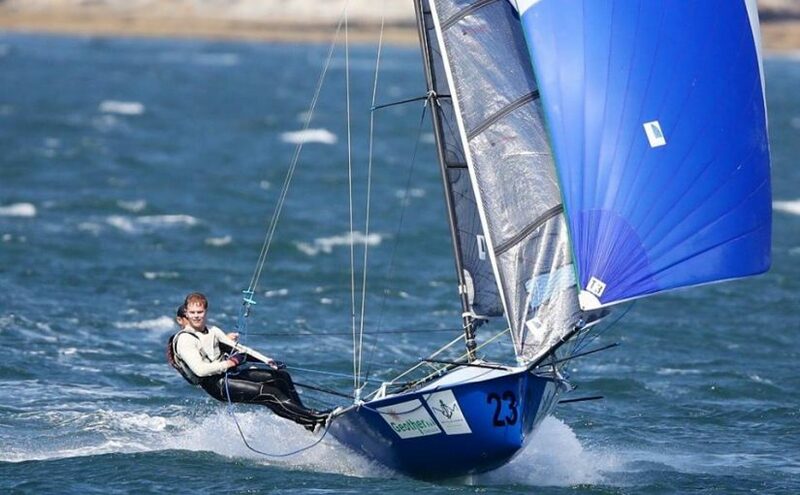 Dimension Polyant gave us new spinnakers and were really supportive,” said Press, who is thrilled to see his and Yabsley’s name engraved on the Silasec trophy for a second time. 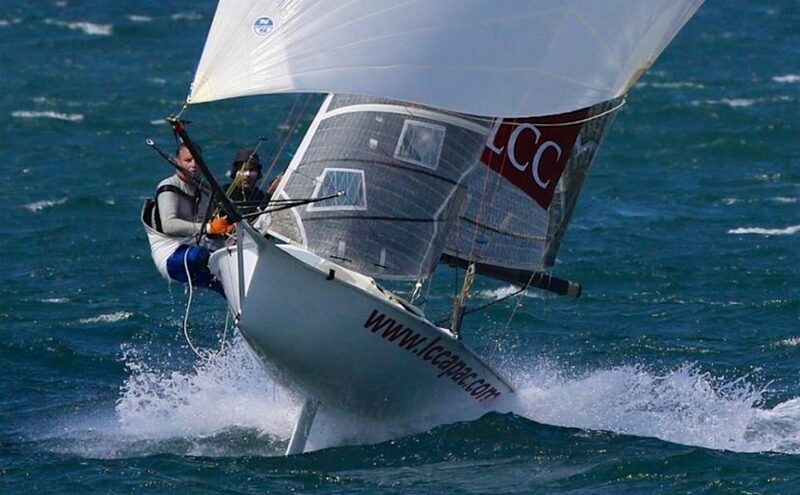 Of second placed Garde, the current national champion, Press said: Brett (Hobson) is always hard to beat – and Dad too (Murray, skipper of Gemmell Sails which finished fourth on countback to Kiwi entry Nuplex). Murray, in turn, is very proud of his son’s win. “They deserved it, they sailed well all week,” he said of Nick and Yabba. Yabsley was especially pleased with their big win in Race 10. 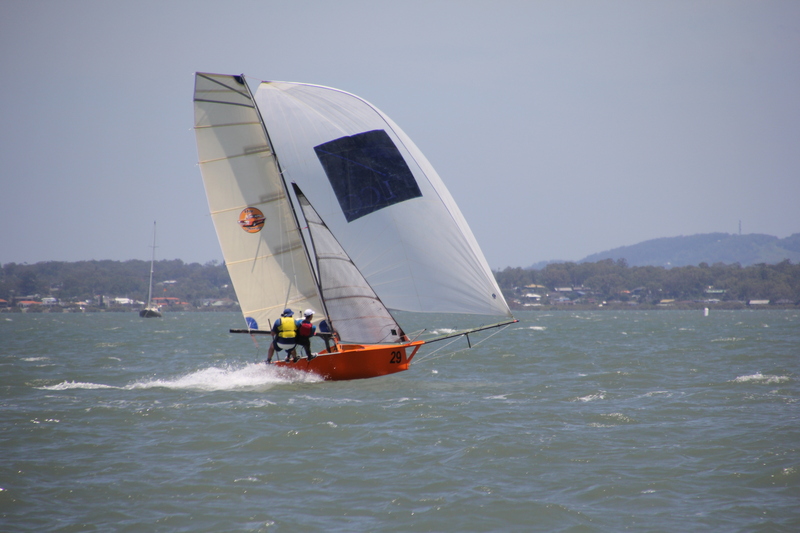 “It’s amazing what you can do when you’re not feeling the pressure anymore,” he said, adding: “Hanging onto the title is a feeling more than anyone would ever believe – I can’t explain it.” Like one or two others in the fleet, Press will now move to 18ft skiff sailing this Sunday. “I usually race 12s on Saturday and the 18 on Sunday.”The 12 is like a sports car and the 18 is more like driving a bus,” he reckoned. Of their second place overall, skipper Brett Hobson was pragmatic. “Obviously we would have preferred to win, but we had a great regatta. We always new it would be hard to come back from our first day results (10th and sixth places),” he said. “We preferred the big breeze of Wednesday though,” said Hobson, who took out both races that day in a big eas-nor-easter. Today’s conditions did not live up to the forecast of up to 30 knots from the north-east, instead the fleet raced in an up to 20 knot nor’ easter, which most others preferred to the carnage-causing Wednesday conditions. “We’ve got a new boat and we spent months and months building it, so it’s good to know it all works,” said Hobson who explained: “We were well-placed in the last race, but we got the gust from hell on the last run; it drove us right off the course and we couldn’t get back,” he said. However, the Silasec trophy hasn’t completely left Hobson’s hands – it will stay in the family, as his younger brother Scott is to marry Nick Press’ sister, Emma, this year. 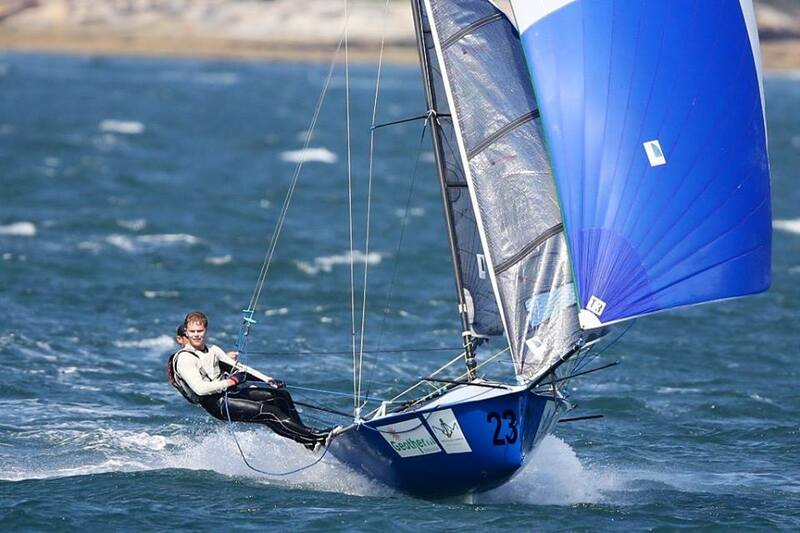 Best placed of the Kiwi entries, Alex Vallings’ fourth and third places today was enough to knock Gemmell Sails out of third place on countback, the two finishing on 29 points each. Vallings cited “lack of preparation and maybe I’m too experimental,” as to why he did not finish in the top spot. I haven’t used my number 2 rig and I’ve only sailed with my big rig twice – but I haven’t used it for racing yet. I might have been better using my old rig.” But the fact he did not come with a regular crew and sailed with two different crew members he would never usually sail with, says a lot for Vallings’ sailing ability. “I need to do more sailing and with a regular crew,” he said. On the venue, Sydney’s Parramatta River on the upper Harbour, Vallings mused: “Conditions were super tough.” To win, he said, “You have to have a good crew Like most the other Aussie entries, Hobson and Johnson will next contest the Garde Sprint Series in February and the Port Jackson Championship in March. Competitors were told to expect a big nor-easter, but in its place was a lovely nor-east of up to 20 knots, described by competitors as “the best day of the regatta.” Today’s racing was close in Race 9. 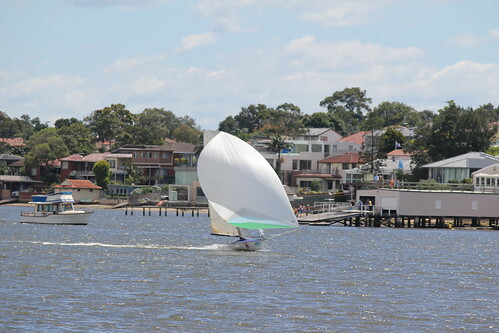 The top 10 changed places, particularly on the works where most hit the corners, zig-zagging their way up past the start area in the narrow body of water near the Hunters Hill Sailing Club. 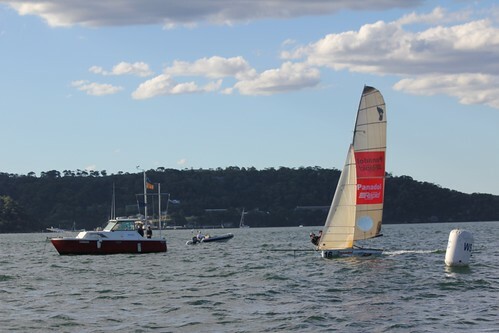 In Race 10, down the run the first time, Dimension Poylant led by a country mile from Nuplex, Frankenskiff, Gemmell Sails, As Good As It Gets, Garde, C-Tech and Andrew Short Marine, which constantly swapped places throughout the race. 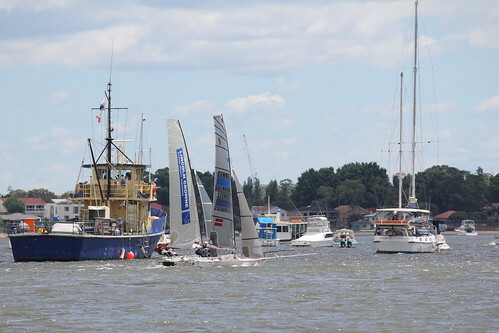 On the second downwind, which took the fleet the other side of Cockatoo Island, Dimension Polyant’s lead was around one minute 40 seconds from Nuplex with a second Kiwi entry, Frankenskiff, hot on her tail. 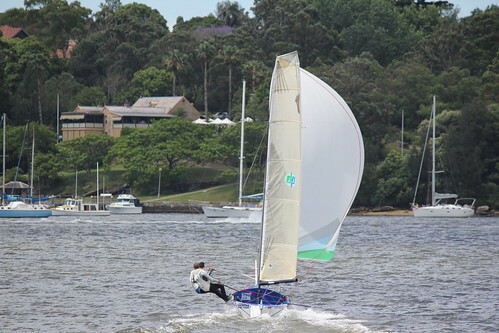 Andrew Short Marine (Michael Spies/Damian Vlotman) from Lane Cove 12s won the handicap event from Gemmell Sails (Murray Press/Ben Gemmell) also from Lane Cove 12s, with the Lachie Paramor/Morgan White sailed Cunning Stunts (Woollahra Sailing Club) third. Australia won the Teams Event for the John Brooke Trophy. 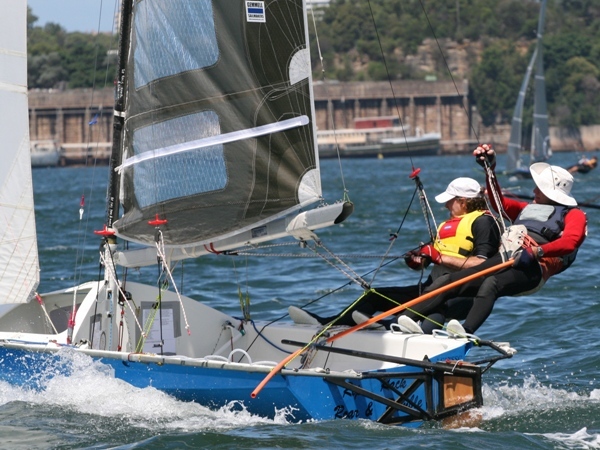 Other winners will be announced at the prize giving at Hunters Hill Sailing Club this evening. 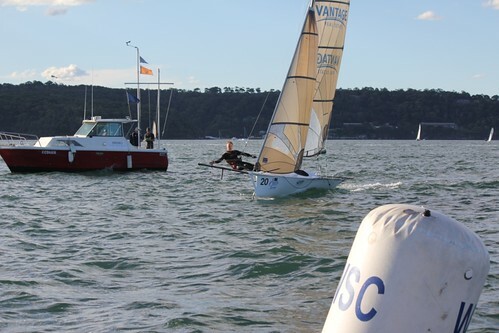 Thirty-four skiffs from Australia and New Zealand contested the SLAM 12ft Skiff Interdominion, hosted by Lane Cove 12ft Skiff Sailing Club, with the cooperation of Hunters Hill Sailing Club. The 51st edition of the annual Australia versus New Zealand competition, finished this afternoon. This entry was posted in Race Reports and tagged Sydney on January 14, 2011 by Karmen.